A couple of weeks ago my friend Alyssa and I went on a trip to Yamanouchi, in Nagano prefecture. 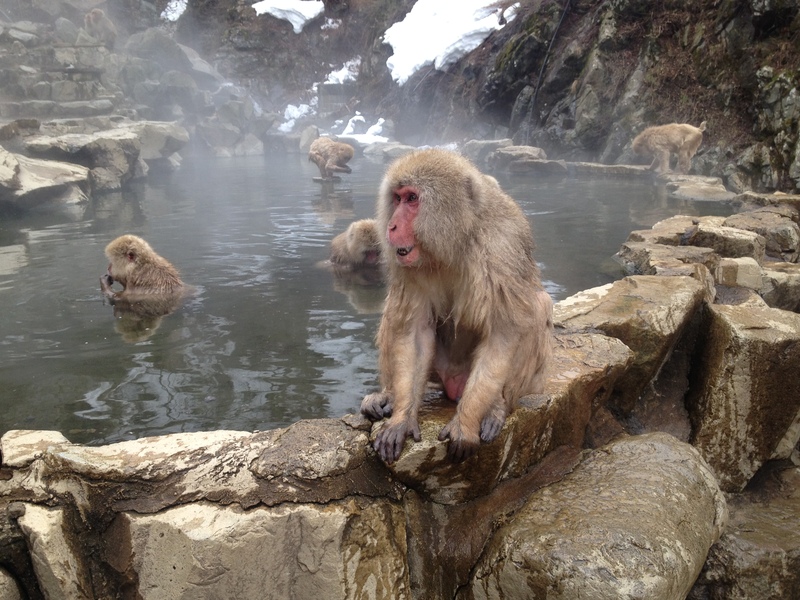 Our plan was to spend one day skiing, and the next looking at monkeys having baths. On that count the plan was a roaring success, but that’s not all we managed to do. We also saw monkeys fighting and bought monkey stickers. We rode through a desolate landscape on a big train. 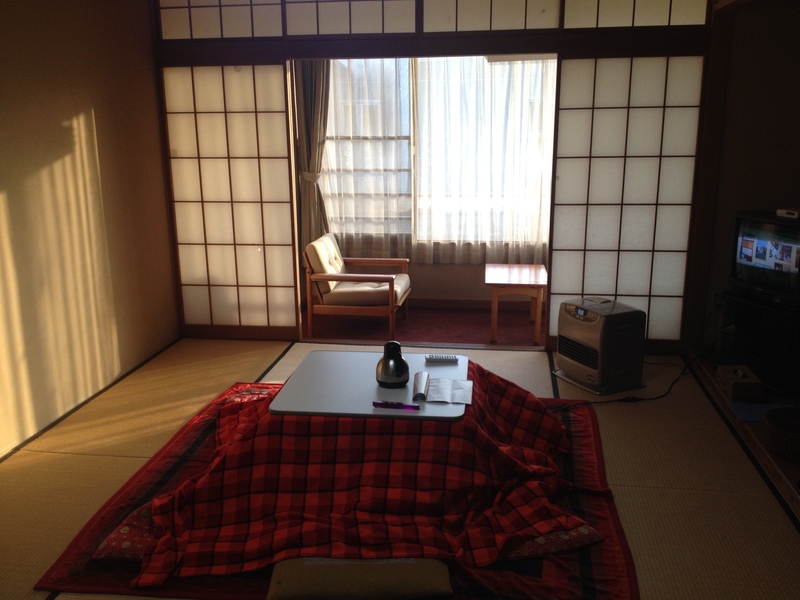 We experienced everything a kotatsu has to offer, over and over again. After a three hour train journey starting at the austere hour of 7am, we arrived at Nagano station. From there it was another hour by train to the town of Yamanouchi, our base of operations for our monkey-and-skiing holiday. The approach to Yamanouchi was, to say the least, kind of nerve-wracking, as the town itself was preceded by a thirty minute ride through absolutely nothing. The entire landscape was populated by three things and three things only: (a) fields of tiny dead trees, (b) villages of tiny, dead-looking houses, and (c) no snow. As our journey continued and a fourth element – various kinds of rubble – was introduced we started to worry that our extensive one evening of planning had somehow led us astray. Had we come too late in the season for skiing? Had we gotten on a train for Yamanouchii rather than Yamanouchi? As the minutes passed and even the distant mountains seemed devoid of snow, we started to worry in earnest. But luckily, we hadn’t made a mistake. Instead, we were witnessing rural Japan’s impressive ability to occasionally transform into a perfect simulacrum of a failed post-Soviet state. While Ghibli films might make us think of the Japanese hinterlands as serene, traditional places full of crystal-clear waterfalls and ornate mountain shrines, a large proportion of countryside here looks like it’s recently been hit by a bomb filled with wrecked car engines and partially-shredded tarpaulins. When we got off the train, however, we found that Yamanouchi itself was very nice, with interesting-looking narrow streets, and steam from the underground hot springs rising from manhole covers. And soon enough we learned that the nearby Shiga-kōgen ski park was still snowy and open for business. After an all-too-brief encounter with the owner of our hotel – a man who spoke good English, but who spoke in such unusual ways that we could never tell if he was just slightly eccentric or if he was constantly and subtly mocking us – we were off to see the famed bathing monkeys of Joshinetsu Kogen National Park. From the entrance to the park we took the long, winding path that led towards the hot springs. It was so long and circuitous, in fact, and we passed so many other foreigners on the way that we started to suspect that the improbable promise of monkeys in hot springs was merely a ruse designed to draw in the real spectacle – gullible foreign tourists – so that Japanese people can watch them undisturbed in their natural state – one of dull, impotent confusion. But just as we we voiced these surprisingly plausible concerns a barrel of monkeys crested the hill and swarmed around us, nearly a dozen in all. Now having seen wild monkeys once before, and considering myself something of a wild monkey expert as a result, I knew that there was nothing a monkey finds less interesting than a human without food. So despite the proximity of the monkeys to us and our soft, unbitten faces, I wasn’t particularly worried. Alyssa, on the other hand, who is what we in the know like to call ‘monkey shy’, was understandably a little less tolerant of the sudden appearance of wild animals right next to her. And after beating a hasty retreat, we set about observing the monkeys from a safe distance. The monkeys were obviously both hilarious and amazing, as all monkeys undoubtedly are. We naturally kept our distance, but some people clearly weren’t so cautious, as there were lots and lots of signs dotted around the area warning of various monkey-related dangers, including one sign that informed us in no uncertain terms that ‘the Japanese monkeys do not understand your language’, before providing an exhaustive list of all the myriad ways one can unwittingly provoke a monkey to violence. But fortunately there was no violence, unless one counts monkey-on-monkey violence in which case there was loads. And what was most interesting about watching the monkey-on-monkey violence was that it was simultaneously so alien and so human. 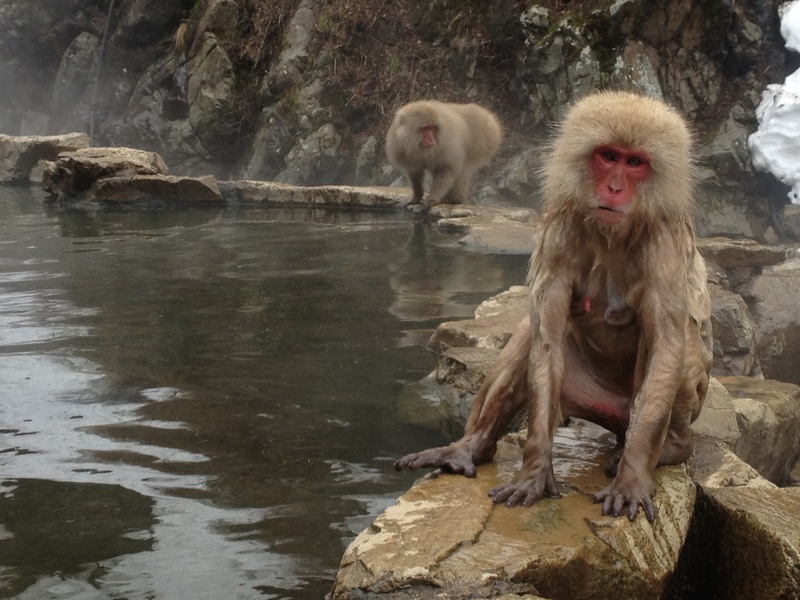 The incredibly needless, purposeless malice of one monkey slowly wading over to another monkey in the hot spring, before nonchalantly grabbing them from behind and plunging their teeth into their neck for literally no reason whatsoever. The sudden transition from placid calm to shock and confusion on the face of the victim. Having spent the last year teaching children I saw a lot I recognised in the actions of those terrible monkeys. 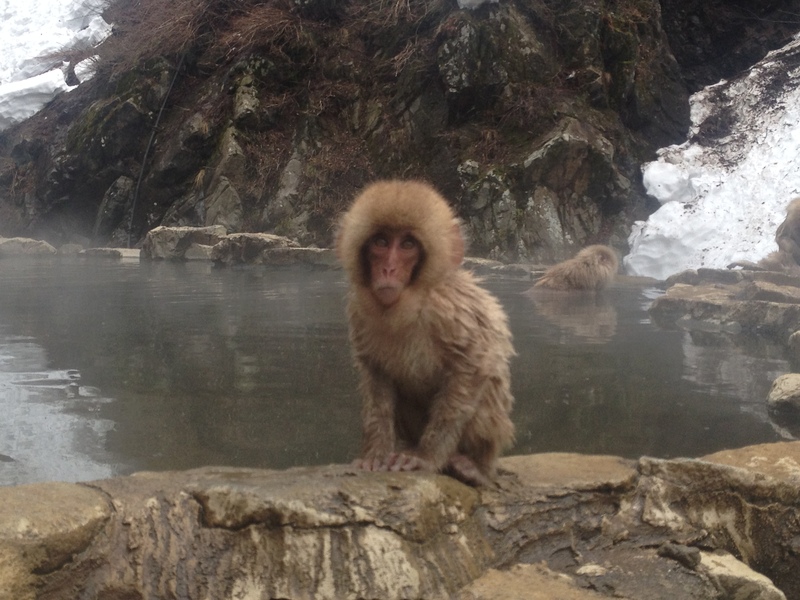 Also, while many of the monkeys were extremely cute, especially when they were sitting contented in the hot springs, I wasn’t aware of how terrifying some baby monkeys’ faces can look. From the right angle they’re nothing but cute, playful critters, but catch a glimpse of their faces and you’ll notice that they’re dead-eyed little skull monsters. After we’d had our fill of monekys we decided to walk back to our hotel. It was about a forty minute walk up and down some fairly steep hills, but I’m glad we didn’t decide to get the bus as it meant we were able to see the Shibu onsen area. The Shibu onsen area is a small part of Yamanouchi filled with awesome traditional bath houses. Unfortunately, we soon found that, as tourists not specifically staying in the Shibu area, even the nine public hot springs lining the main street were off-limits to us. Slightly disappointed but not disheartened, we returned to our hotel and retired to the kotatsu, before going to a restaurant and trying out the hotel’s own hot spring baths, which was, like all hot springs, too hot for my pathetic baby-like skin. The next day was all about skiing, including some runs on Olympic courses, some scarily big jumps in the terrain park, and of course a good deal of waiting behind groups of snowboarders who had decided to ruin things for everybody else. Halfway through the day we decided to ski over to another mountain, only to find ourselves trapped at the bottom of that mountain due to ski lifts that appeared not to know where they were going. Eventually we (just) made it back in time for the bus, only to then get on and off the wrong bus a good three or four times before finally stumbling upon the one we needed. Both exhausted after around six hours of solid skiing, we decided to go to the Yudanaka public baths, which were free for anyone staying in a hotel in the area. I had a great time, sequestered as I was off in the men’s section, completely by myself. But I could hear the sound of multiple screaming babies from over the dividing wall, and sure enough Alyssa reported that the women’s section was so loud and full of screaming, running babies that she left after a few minutes to return to the safety of the kotatsu. I ordered curry rice, and afterwards I tried a bottle of locally brewed porter called Shiga Kogen Porter (from the nearby Tamamura Honten brewery). I originally considered doing a review of it as part of this post, but since I’ve always found myself completely unable to describe even the most basic of tastes, I didn’t know how useful it’d be. Everyone else seems to drink wines, or craft ales and note how there are hints of persimmon and espresso chocolate, whereas the only flavours I’m really 100% on board with are ‘savoury’, ‘twiglet/marmite-induced nice teeth aches’, and ‘this is so good my salivary glands are never going to stop going’. I suppose I can just say that the Shiga Kogen Porter is thoroughly recommended, and best enjoyed in an exhausted daze in the comfort of a kotatsu. The next morning we were up early for the train back home. We were sad to leave, but our two day holiday in Yamanouchi was definitely up there as one of the best Japanese holidays. It was a nice change from the usual (and also brilliant) trips to bigger, more well-known cities like Hiroshima, Kyoto, and Osaka. I’m really looking forward to planning some more holidays in smaller, slightly more remote areas like Yamanouchi, and I’d recommend a few days there to anyone with even a passing interest in monkeys, hot springs, or monkeys in hot springs, even if you’ll have to pass through a lot of rubbish tarpaulin-and-rusted-car-part towns on the way there. 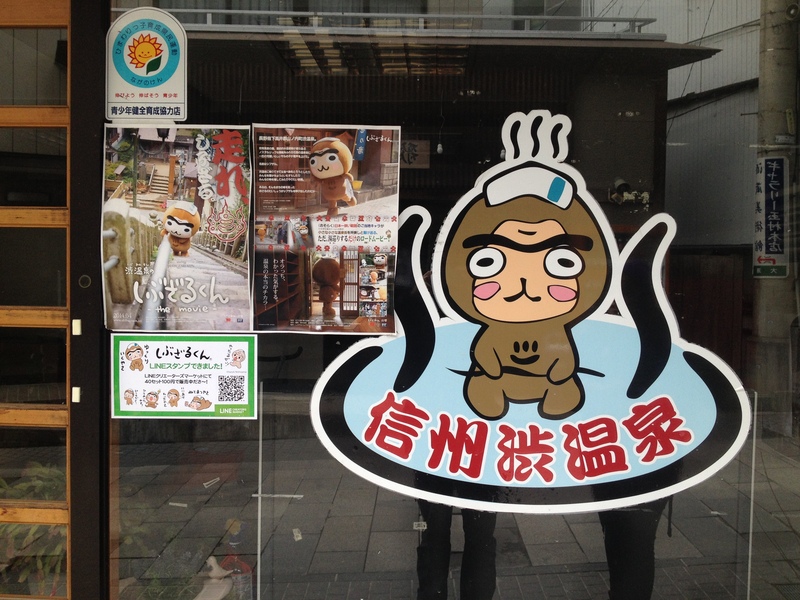 This entry was posted in Actual Real Life Stuff, Japan and tagged Jigokudani Monkey Park, Shiga-kōgen, Yamanouchi. Bookmark the permalink.